Image title take from heading placed on the left side of the photograph. 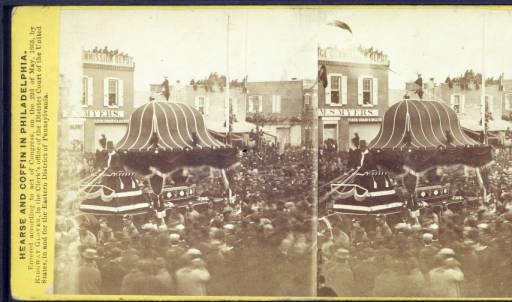 This picture clearly shows the coffin of President Lincoln and the hearse that carried his body through the streets of Philadelphia. A large crowd gathers around the hearse, as onlookers are visible on the roofs, awnings, and from the windows, as well pressed in all around the hearse. Additionally, this image clearly shows the honor guard that escorted Lincoln's hearse.